Articulating the Caribbean as one geopolitical place has been a problematic that Silvio Torres-Saillant has delineated in his book Caribbean Poetics: Toward and Aesthetics of West Indian Literature. Torres-Saillant posits that in order to understand the literature being produced in the Caribbean the reader must first understand that ideas of literature, literary theory, and language are not necessarily universal. What he means is that the Caribbean must be understood in terms of its own history before any claims can be made about the literary merit of its writings. Moreover, the reader brings expectations to the text with that are contextually and culturally embedded. In this project Torres-Saillant wants “to demonstrate that Caribbean literary texts, at least since the early twentieth century, are linked amongst themselves by an aesthetic kinship born of the more or less common experience lived by Caribbean societies (Torres-Saillant 11) even though the literatures are written in European languages. Attempting to articulate the Caribbean as one space has been difficult because of the various languages and ethnicities that make up the place, but there is a considerable amount of literature that deals with considering the Caribbean as one homogenous region that echoes the “existence of a common Caribbean essence” (70). A common emphasis is the relationship between race and literary consideration, but Torres-Saillant says, “the search for black aesthetics had more to do with a condition of oppression with clearly delineated socio-historical contexts than with the biology of pigmentation” (71) arguing for similarities and unity through the experience of colonization. But in the Caribbean black is “not the only Caribbean color” (73); there are in fact East Indian voices such as Sam Selvon and VS Naipaul. But despite these differences, Torres-Saillant argues an essentialist argument, that “the unity of the Caribbean literature transcends racial distinctions precisely in the act of absorbing multiple racial traumas” (73). Torres-Saillant emerges from Caribbean notions of creolization as a template for understanding positionality in a multiethnic space. According to Bernabé, Chamoiseau, and Confiant there is no Caribbeanness without interiority first, without thinking from a rooted location instead of centering Africa and Europe as originators. Creoleness is this sense of being defined as “the interactional or transactional aggregate of Caribbean, European, African, Asian, and Levantine cultural elements, united on the same soil by the yoke of history” (Bernabé, Chamoiseau, and Confiant 280). It was born of the uprooting of various peoples and cultures; it is a reinvention of self, “an annihilation of false universality, of monolingualism, and of purity” (281). Creoleness calls for a cessation of racial distinctions toward a new type of humanism, something differently articulated and understood in differing spaces. The example that Bernabé, Chamoiseau, and Confiant use is one of the “Hindus” of Trinidad who never fully Creolized but adapted to life in the Caribbean, and how this differs from Caribbean country to country. They even posit it as a framework to create solidarities with other Creolized plantation spaces like Hawai‘i; indeed they make the motion to make Creolization a framework for understanding the world in a globalizing era. Rahaman’s two poems in the book Sūrīnām Mein Hindī Kavitā, published in 1984, speak to the vocabularies of indenture, national inclusion in Surinam, and the unification of Hindus and Muslims under indenture. Since these poems are in Hindi/Bhojpuri I have translated them in order to speak of their importance. Two dharmas working together that no one parsed. This couplet is remarkable in its insistence of the word coolie as an identity based in the economic function of the members of this diaspora — an anticommunalist identitarian approach that Khal Torabully alludes to in his book Coolitude: An Anthology of the Indian Labour Diaspora. Torabully sees the word “coolie” and the concept of coolitude as syncretic: a composite identity that interacts with various populations of people in the new matrices that coolies and their descendants find themselves in. In Torabully’s configuration, India is not a monolithic place, but rather a place of great diversity — the coolie was formed through the economic relationship and exchange of British imperialism and the global capitalism that spawned the sugar trade, galvanizing people of differing dharmas, to echo and to illustrate the vocabularies of indenture. Here, the focus is crossing the ocean to work in the fields, the trauma of passage to plantation that Vijay Mishra articulates as girmit ideology. With the title being “Indian,” what the poet does is make the connection between this history and the identity, a layering of economic base with identity — that they are girmityas because they have been traumatized by crossing the ocean. Here we also see the usage of the word sirdar, or landowner, that I add to the vocabularies of indenture. who came here without any rights. The poet establishes the beginnings of a national inclusion in the Surinamese landscape — the people who were once without rights have been able to succeed once their contracts ended. The poet uses the word Lakshmi in a display of syncretism in which it refers to the Lakshmi, the Hindu goddess of wealth, which in this case also means the attainment of hearth and wealth. But given that the name of the poet is Muslim in origin, what Khan also found in diaspora was a connection to Hindus that posited them as equals and one. In both Munshi Rahaman Khan poems examined here the poet focuses on the commonalities between all the people who came as indentured laborers, specifically working to desegregate religious communities. He uses vocabularies of indenture by thinking through the word girmit to signify the movement of people on a global level. The surprising use of the word girmit instead of the Sarnami Hindi work kantraki (contracted labor) suggests this. Kantraki in use can be found in the music of Raj Mohab and the film The Last Kantraki. 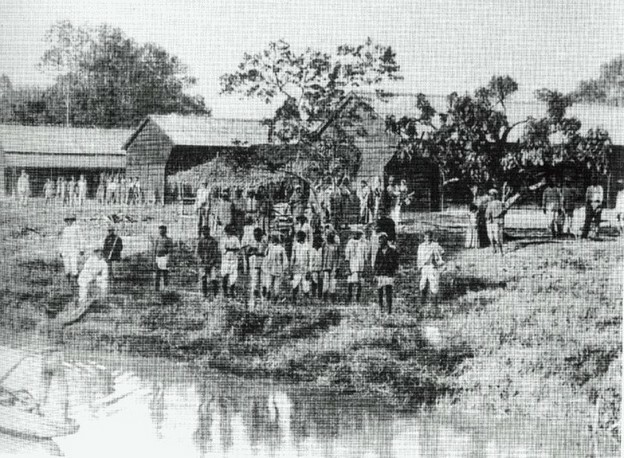 The word girmit does not appear elsewhere in Sūrīnām Mein Hindī Kavitā and may in fact illustrate a connection between Surinamese indentured laborers and those that wound up in Fiji. This is elaborated in various works where the SS Fath Al Razak is documented travelling from India to Trinidad as well as from India to Fiji. Sasha Kamini Parmasad was born in Trinidad and is sixth generation Indo-Trinidadian. In 2008 her poem “Memory of Sugarcane Worker Off-Duty” won the Poetry International prize. The poems that will be discussed are two that appear in print in Indivisible: An Anthology of Contemporary South Asian American Poetry published in 2010. The poet’s use of the words “talvar,” “cutlass,” and “sepoy” show possible additions to Pirbhai’s vocabularies of indenture — here specifically the talvar as a sword is related to the work of cutting cane with a cutlass (machete) and how both of these items are connected to Indian sepoys who revolted against colonial masters. The connection between the talvar and cutlass in this poem shows a coolitude orientation in which agency is given to the bearer of both despite their differing colonial subject positions. and mash it up forever. The old man of the poem conflates two disparate communities with his use of the word “coolie” to describe a Tamil Tiger in Sri Lanka with the Indian in Trinidad. He uses the word coolie to show the restrictions under indenture. “Stay in your place, Mr. Coolie-man / Go back where you come from; / Iere is not yours to love,” says a voice that illustrates the limitations that are placed on the diapsoric subject: that the present context is not “home” in any originary way, that diaspora refers to an elsewhere. The word coolie here refers to a Sri Lankan who has a community of Tamilian Indian Indenture diaspora, and the speaker makes the connection between these two diverse groups. The Trinidadian coolie history is placed on the shoulders of the Tamilian Sri Lankan the old man refers to. However, what is not evident is whether the Tamilian Sri Lankan referred to is in fact part of the Indian Labor Diaspora from the nineteenth century. The old man cannot envision any other ways of being Indian, a place that’s haunted with crossing the kalapani (“his face a ploughed ocean”). Here Parmasad shows a stake in Trinidad and a diasporic belonging as leaning toward India but bound to be forever distant. Anderson, Benedict. Imagined Communities: Reflections on the Origin and Spread of Nationalism. New York: Verso, 1983. Print. Banerjee, Neelanjana, Kaipa, Summi, Sundaralingam, Pireeni, and Ebrary, Inc. Indivisible an Anthology of Contemporary South Asian American Poetry. Fayetteville: University of Arkansas, 2010. Print. Bernabé, Chamoiseau, and Confiant. “In Praise of Creoleness.” Postcolonialisms. Eds. Desai and Nair. New Brunswick: Rutgers University Press. 2005. 274–289. Print. Brathwaite, Kamau. History of the Voice: Development of Nation Language in Anglophone Caribbean Poetry. London: New Beacon Books Ltd. 1984. Print. Carter, Marina and Torbully, Khal. Coolitude: An Anthology of the Indian Labour Diaspora. London: Anthem Press. 2002. Print. Chatterjee, Partha. The Nations and its Fragments: Colonial and Postcolonial Histories. Princeton: Princeton University Press, 1993. Print. Gopinath, Gayatri. Impossible Desires: Queer Diasporas and South Asian Public Cultures. Durham: Duke University Press, 2005. Print. Mishra, Vijay. “(B)ordering Naipaul: Indenture History and Diasporic Poetics.” Diaspora: A Journal of Transnational Studies. 5.2 (1996): 189–237. Project Muse. Web. 8 Oct. 2013. Mishra, Vijay. The Literature of the Indian Diaspora: Theorizing the Diasporic Imaginary. New York: Routledge. 2007. Print. Pirbhai, Miriam. Mythologies of Migration, Vocabularies of Indenture: Novels of South Asian Diaspora in Africa, the Caribbean, and Asia-Pacific. Toronto: University of Toronto Press. 2009. Print. Satīśa, Umāśaṅkara. Sūrīnāma Meṃ Hindī Kavitā. Saṃskaraṇa. ed. Deharādūna: Jugala Kiśora Eṇḍa Kampanī, 1984. Print. Shankar, Subramanian. Flesh and Fish Blood: Postcolonialism, Translation, and the Vernacular. Berkeley: University of California, 2012. Print. Torres-Saillant, Silvio. Caribbean Poetics: Toward an Aesthetic of West Indian Literature. Print. Vasu: Pacific Women of Power : Fiji’s First All Woman Exhibition. Suva, Fiji: Vasu Collective, 2008. Print.